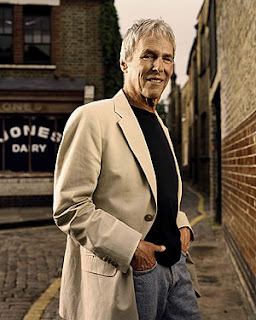 Burt Bacharach, is without a doubt one of the great pop music composers of all time. Many of his songs -- like "Bond Street" -- feature the suave, swinging, beat sound that is so identified with sixties popular music. His compositions are best suited for trumpet, I've always thought, and there isn't a Bacharach tune that doesn't just sound better with horns aplenty blaring away. His melodies are catchy, his timing perfect. His pop sensibility is unequaled, and his songs have come to define the easy listening genre more than any others. Burt is perhaps best remembered for his work with Dionne Warwick, and for his Oscar winning score to Butch Cassidy & the Sundance Kid, and of course the movie's theme song "Raindrops Keep Falling On My Head." But, there's a great deal more to Burt than this. Born in Kansas City, MO in 1928 he studied music all through his childhood, becoming an accomplished pianist, cellist, and even percussionist at a relatively young age. A lover of jazz, especially bebop artists like Charlie Parker, Burt went on to study at the Mannes School of Music in New York as well as at McGill University in Montreal and the Music Academy of the West in Santa Barbara. After an early 1950s stint in the Army as a piano player, Burt met lounge singer Vic Damone ("Hey Little Girl") in Germany and became his pianist, as well as playing with other club singers like Imogene Coca, Joel Grey and Steve Lawrence. In 1957 Burt teamed up with Hal David, to form what would become one of the longest and most successful songwriting duos in pop music. Some of their earliest hits were "Magic Moments" which they wrote for Perry Como, and "Baby It's You," which they wrote for the Shirrelles and which was later recorded by the Beattles and Elvis Costello. In the early sixties Burt met Dionne Warwick, who was working as a member of the Drifters backup group. Thier meeting was most fortunate for both of them. With Burt's help Dionne scored eight top ten hits with songs written by Bacharach and David: "Walk on By," "Anyone Who Had a Heart," "I Say a Little Prayer," "You'll Never Get to Heaven," "Message to Michael," "Trains and Boats and Planes," "Do You Know the Way to San Jose?" and "Promises, Promises." Bacharach also wrote hit songs for other singers such as: Sergio Mendes and Brazil 66 -- "The Look of Love"; Manfred Mann -- "My Little Red Book"; Jack Jones -- "Wives and Lovers"; Bobby Vinton -- "Blue on Blue"; Herb Alpert -- "This Guy's in Love With You"; Dusty Springfield -- "Wishin' and Hopin'"; 5th Dimension -- "One Less Bell to Answer"; Tom Jones -- "What's New, Pussycat? "; the Carpenters -- "Close to you"; and many others. 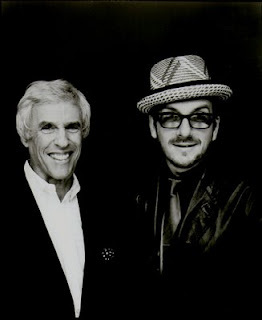 As the sixties came to an end, Bacharach garnered more accolades when he and David wrote the Broadyway musical Promises, Promises earning themselves a Tony nomination and Grammy as well as a hit song for Dionne Warwick. 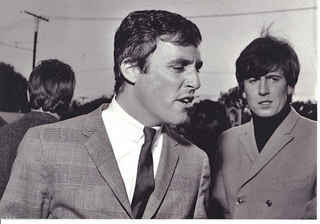 Bacharach didn't stop with Broadway success, but moved into films where his movie scores have made him even more famous. His movie credits include: Butch Cassidy & The Sundance Kid, Alfie, Casino Royale, What's New Pussycat?, Arthur (with Peter Allen and Christopher Cross), Night Shift and Arthur 2: On the Rocks. And then of course there was his memorable cameo appearance in Austin Powers International Man of Mystery. His impact on rock music is ubiquitous and undeniable. Everyone cites him as an influence, from Saint Ettiene to Swing Out Sister to Beck. And everyone covers him from Elvis Costello and the Attractions in the '70s, to Naked Eyes in the '80s, to Oasis, Pearl Jam and Faith No More in the '90s, to Sheryl Crow, The White Stripes, Dr. Dre and the Offspring in the 21st century. Most notably though was his 1998 collaboration with Elvis Costello resulting in the excellent Painted from Memory album. Still, there's just something cool about Burt's songs from the sixties. It's those songs that I know and love, and always will.